I blame the nuns - they made me wear a wine uniform for 5 of my teenage years. Strangely, it's not put me off the colour at all - however, I draw the line at v-neck jumpers, a-line skirts and wooly tights.. So it's a no shopping post for the Bank Holiday weekend. It's all about old faithfuls that have been in your wardrobe for more than a few years. I'm wearing a burgundy blazer that I picked up in TK Maxx about 5 years ago, along with my Ted Baker boot cuts from their outlet in Kildare Village (4 years old), a stripy boat-neck top from Tesco (3 years old), and my Clarks ballerina pumps which are almost 3 years old. A good reminded to me to have a rummage in the back of the wardrobe now and again and enjoy something that was bought years ago. 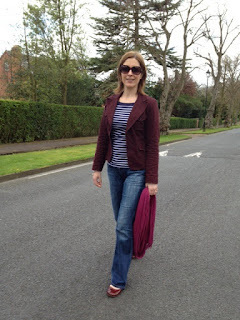 I had forgotten how much I loved this blazer so it was lovely to come across it again.